Does your company have a product to put on the skin for the bed bug bites? Our company sells a product called the All Stop Healing and Protection Spray. The product is made to use on bed bug bites to help with inflamation and itching and to help heal without scarring. If I wash my clothes in cold water will the bed bugs drown? It is not proven the bed bugs would drown by using cold water in your laundry. Our company suggests using a hot water cycle when treating your laundry for bed bug infestations. Can I spray the Dead Bed Bugs Contact Killing Spray on my clothes? You can spray the All Stop Dead Bed Bugs Contact Killing Spray directly on the carpet. Remember nothing needs to be saturated, only lightly sprayed. Can bleach be used to kill bed bugs? It is not proven that bleach will kill bed bugs. However, if bleach is effective in killing bed bugs it would only be a contact killer with no residual effects. Do the Bed Bug products stain? Our products should not stain. However, it is recommended that you do not saturate anything with the All Stop Dead Bed Bugs Contact Killing Spray. It is also a good idea to test the product on a small section of your furniture are carpeting, especially if you are treating white furniture. Are your bed bug products available in stores? 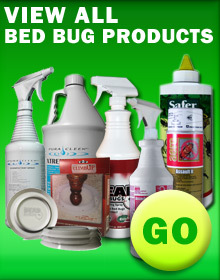 Our bed bug products are available in stores. It is mainly available in our main offices located in Erath, Louisiana at this time. How long have your bed bug products been on the market? Our specific bed bug line of products have been sold since 2005, however our company has been in business and selling other products since 2003. Bed bugs will usually leave red, itchy bite marks on the skin of their victims. They can sometimes be spotted hiding in the cravices of items that have been infested, such as mattresses, pillows or blankets. Does PuraCleenRx Disinfectant Spray work to kill bed bugs? The PuraCleenRx Disinfectant Spray is not made to kill bed bugs. It is formulated to disinfect and clean your environment from all of the bed bugs secretions, feces and egg shells; which contain bacteria. What are bugs that bite in bed? The most common bug that bites in bed is the bed bug. This is because it is the only time that you are still and not moving for hours at a time. Copyright © 2010 DeadBedbugs, all rights reserved. No part of this publication may be reprinted without the expressed written permission of DeadBedBugs. Internet Marketing by Q-Based Marketing Visit Our Shopping Cart for a full list of products All Dead Bed Bugs Products and the products of its divisions are safe and non-toxic when used as directed.